The Foundation held our first Golf Classic at Burhill Golf Club on June 12th, successfully raising funds and awareness for upcoming projects. 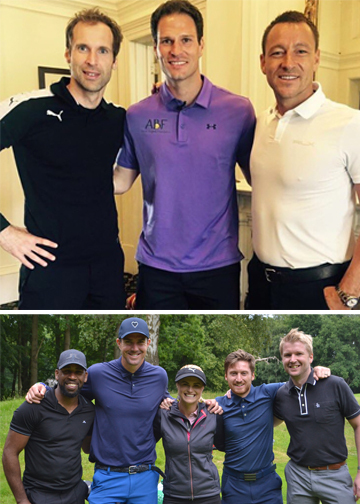 Asmir was joined by many friends from the sporting world including; Petr Cech, John Terry, Roberto Di Matteo, Jamie Redknapp, Kevin Pietersen, David James, DJ Spoony, Carli Booth and Carlo Cudicini, amongst others! The ABF was founded to build and improve recreational facilities both in England and Bosnia-Herzegovina, encouraging kids to be active and provide them with the opportunity to get involved in sports. Projects the Foundation has supported to date in Bosnia have included the construction of an all-weather surface at a school for disabled children in Mjedenica, renovation of the multi-sports pitch at the School for Children with Special Needs in Tuzla and, most recently, the Foundation has co-funded a football pitch at the Sports Complex in Srebrenica. In England, the Foundation has made donations to Redgate Clayton Football Club to refurbish their shower/changing room facilities, The Mary Hare School for Deaf Children to refurbish their swimming pool and, last month, to Stepgates Community School for their “Big Splash” appeal so children do not have to travel out of the area for swimming lessons.